The Department of Medicine recognizes that faculty and staff want to serve the greater community and have fun doing it. Over the last several years, we have taken on projects to tackle together, and invite the participation of all. 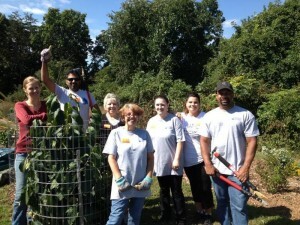 Department of Medicine volunteers at a United Way “Day of Caring” worksite. A team from the Department of Medicine’s Human Resources (right) work at Jackson-Via Elementary School for a United Way Day of Caring. Team members Brian Gittens, Kristen Crawford, Christina Hamill, Gail Hundley, A.J. Leo and Ally Mawyer hauled lumber for the school’s fence and shed, primed its kiosk and cut back weeds. 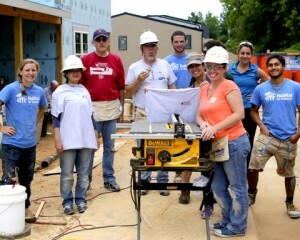 Department of Medicine volunteers at a Habitat for Humanity worksite. DOM sponsors volunteer work days for the Greater Charlottesville Region Habitat for Humanity organization. DOM work crews spackle and paint, hang dry wall, and perform a variety of other tasks to help complete the homes of Habitat partner families. A recent project helped to “transform a long-time City dumping ground into a pedestrian-oriented, sustainably built, 46-unit neighborhood in the heart of Charlottesville,” according to Habitat. UVA staff members talk with Charlottesville High School student. SOM’s Office of Diversity and DOM also team up to host an annual “Inside UVA Medicine” event for Charlottesville middle-schoolers. Seventh graders experience the “in-the-round” classroom where UVA medical students learn, visit the Medical Simulation Center, go up to the hospital’s Pegasus helipad, among other activities. Charlottesville middle school students visit the UVA Health System’s helipad during the day-long “Inside UVA Medicine” event. Mud Warriors from the Department of MUDicine participated in this challenging fund-raising event to benefit Charlottesville’s Hope Community Center. A lovely day was shared and money was raised for this worthy cause. CHS student poster winners (left to right) Alli Durrer, Douglas Melendez, Justice Howard, Bria Williams, Inanna Pickering, Jane Scott, and Rachel Jones.